There’s so much more to discover before the world ends and we’re fairly certain Sylens meant the Funko Horizon Zero Dawn Mystery Minis! Featuring both human and robot subjects from the PlayStation 4 game, figures for Aloy, Erend, and a Watcher are essentially scaled-down Pop Horizon Zero Dawn editions. However, the Funko Horizon Zero Dawn Mystery Minis set also introduces a few new PS4 characters to collect, including the Eclipse cult leader, Helis. Additionally, gamers should easily recognize Rost with his braided beard and hair, along with Sylens holding his lance. Machines from Horizon Zero Dawn are eerily similar to real-life animals, such as Thunderjaw, which looks like a T-Rex but with a yellow blaze canister on its back. Less imposing, the Grazer is quite comparable to that of a deer. Despite the fact that each miniature is issued using the established blind-box format, a few of the robots might give away what is inside. For example, Tallneck appears taller than the standard 2 1/2 inches, while the Sawtooth figure is slightly wider. However, this does not guarantee a particular figure. Given that each case holds a dozen boxes, and that there are at least 12 Funko Horizon Zero Dawn Mystery Minis figures, barring any additional exclusives, collectors may only need one case to complete the full set. However, if some figures have increased rarity, it is possible that more than one case is necessary. Known odds for Funko Horizon Zero Dawn Mystery Minis are noted below. 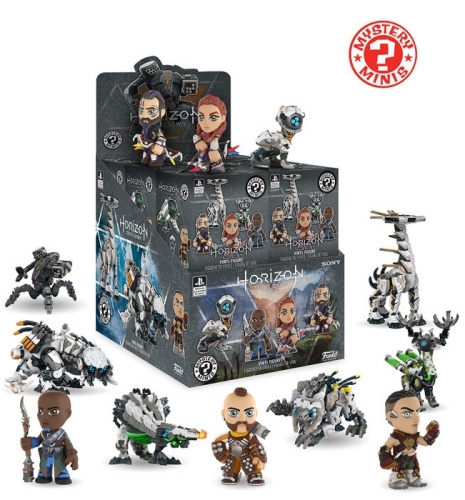 Order Horizon Zero Dawn Mystery Minis Boxes at Entertainment Earth.